Retailers of fine jewellery often have customers come in to inquire about selling jewels. Their reasons for selling vary, but in general, they sell because the jewels are not suitable for the owner’s current lifestyle. Often this has resulted from one of the three “D’s”: divorce, death or debt. Those involved in a divorce may wish to sell jewels that carry memories they want to leave behind as they start a new life,¬† perhaps with¬† another partner. If the¬† separation¬† involves¬† legal acrimony,¬† the¬† ownership¬† of jewels¬† may¬† be¬† in¬† dispute¬† and may need to be liquidated. Others hang on to inherited jewellery¬† for¬† sentimental reasons until they grasp the fact they have a jewellery box¬† filled¬† with¬† items¬† that don’t suit their style or taste. One day, the light bulb goes on and they suddenly realize they can still honour the dearly departed with warm memories and not be burdened by jewellery they¬† will¬† never¬† wear,¬† all¬† the while paying exorbitant insurance premiums.¬† Such¬† inherited¬† property can be thoughtfully transformed into cash, thus allowing the recipient to find something more suitable. Still¬† others,¬† living in a¬† society that demands instant gratification, discover paying for a high-end television, the latest new car or a Caribbean winter vacation can take precedence over owning a pretty bauble that only gets worn twice a year. Valuable jewelled assets can simply be converted to pay down the balance on a credit card or finance a vacation. Many sellers are in their senior years and acquired the jewels 50 or 60 years ago. Others may have recently inherited the jewels from a favourite aunt whose personal history is intertwined with them. I can usually tell a lot about the history of a jewel by examining its various characteristics,¬† such¬† as¬† age,¬† repairs, alterations, quality of gemstones, design, workmanship and overall condition. Before discussing too many of these details, however, I like to ask the client how long they’ve had the jewel in their possession. This usually leads them to elaborate on key milestones associated with the item. Listening carefully to these stories and combining them with my observations of the jewel, I can form a clearer picture of the circumstances of the original owner. To illustrate, I would like to present two jewels that came my way last summer. The first is an art deco brooch. Although I had seen this brooch a few years earlier, I wanted to examine it again to update the market value. Upon re-examination, I was again amazed at the quality of the design and workmanship. Though such an item is usually signed, no markings of any kind could be found. Based on the opinion of a jeweller friend, the client said he thought Carder originally made the piece. I could certainly agree that the styling was very typical of Cartier pieces of the art deco period. On closer inspection, however, I noticed the workmanship on the front was far superior to the finding of the pin that covered the back. Also, it was joined to the top by soft solder. I concluded this backing must have been added later. Soft solder is made of lead and is often used when a repairman does not want to apply too much heat in case it might damage delicate stones or enameling. In this case, there were tiny emeralds that needed protection. Using a pocketknife, I was able to gently pry the pin-finding loose enough to catch a glimpse of some lettering underneath. I expected to see the word “Cartier” but the letters that slowly emerged were disappointing at first. Finally, I was able to remove the entire pin-finding and with my loupe, I could read the very worn but clearly visible “Van Cleef & Arpels”. This was an exciting discovery, since a signature in a period piece can increase the value by double or more. This unusual brooch was thought by some collectors to formerly be the main section of an impressive jabot pin made by Van Cleef & Arpels for the Rothschild family in the 1920s. A jabot is a kind of ruffled scarf worn over a woman’s blouse. The pin has a brooch on either end – the smaller brooch is detachable so that the pin can be stuck through the garment and secured to the blouse. As spectacular as this jabot pin would have been in its original form, its design is also intriguing in other respects. Its surface is covered with small diamonds accented by contrasting spots, a ‚Äì style usually associated with Cartier during the period. 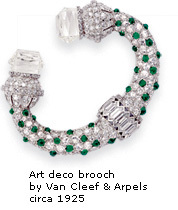 However, true to Van Cleef & Arpels’ strong reputation for extraordinary innovation, two matching diamonds of unique cylinder shaped briolette-cut were drilled to attach invisibly into the terminals of the brooch. The historic significance of this piece was not lost on the dealers and collectors. The final successful price reached $131,200, far surpassing the pre-sale estimate of $20,000 to $25,000. The second example is a delicate emerald, onyx and diamond bracelet. In the jewellery industry, sometimes if it walks like a duck, sounds like a duck and looks like a duck, it really is a duck. In other words, what you see really is what you get. Realistic expectations can often be based on broad experience and pattern recognition. This dainty, platinum bracelet exhibited one of the typical characteristics associated with Cartier and art deco design of the 1920s – coloured spots prominently displayed on a diamond background. In this particular case, a very pleasing series of pave-set diamond cylinders, studded with tiny black onyx cabochons, was fitted to smaller flat-backed black onyx cylinders linked to small oval emerald beads. Only the highest quality design and workmanship was evident, leading me to believe that Cartier was most likely the maker. Lo and behold, under further scrutiny the presumed French assay marks and “Cartier” appeared and I was able to conclude the bracelet was made in France around 1920. A very similar bracelet was one of the highlights of the many tomes dedicated to art deco jewellery in general and Cartier designs in particular. The provenance of this piece is also a major clue to the accuracy of its specific designation. Family anecdotes tell stories related to the titled houses of Europe and the joyously unrestrained lifestyles that promoted the wearing of such a distinguished design. No matter the myriad of reasons for selling personal jewellery,¬† it¬† usually¬† involves¬† a¬† change¬† of¬† lifestyle. Fortunately, there are diverse paths for inheritance of spectacular items and a direct blood relationship is not a prerequisite for acquisition. A great piece of jewellery can always find a good home. And a good home provides the basis for the stories of the next generation. Ron Dupuis a gemologist and graduate jeweller with 27 years of international experience in the valuation of estate jewellery. He is president and CEO of Dupuis Fine Jewellery Auctioneers, based in Toronto.